Some are scary, some are silly, and some are absolute classics- but the one thing they all share is their ties to the Halloween season. There are so many movies that make us think of Halloween and fall, and they give us that spooky feeling that we need to kick the season off right. So just for fun, here is a list of movies that we feel best represents the spirit of each personality type. The Adam’s Family definitely is a movie that has a truly INFJ feel to it. The family that is a unusual, a bit creepy, but at the same time they aren’t evil or bad. They are a lovable family who is just a bit odd and drawn to the darkness. INFJs are complex people who can often feel misunderstood by the world around them, and this is something truly similar to the Adam’s Family. This spooky family is misunderstood by those around them, constantly labelled as weird or odd and this causes people to judge them instead of truly get to know them. For the INFJ the Adam’s Family is the perfect creepy and fun film to represent their personality. ENFJs are social people, who often reach out and search for their tribe or group. They want to make connections and do what they can to help others, but being liked can be important to them as well. Because of this the Craft is a movie that is reminiscent of the ENFJs personality. There is a bit of drama, a lot of emotions, and in the end the lead girl finds a way to overcome all of her struggles and come out strong. The way that our main character starts out feeling a bit reserved and even shy, but in the end does the right thing and becomes the one capable of taking control, is a lot like the ENFJ. They care about what others think and want to please them, but when pushed too far they are strong and capable people. INFPs are somewhat sullen people, who can appear quirky and unusual to most. They have deep emotions and complex inner worlds, which make them difficult for most to truly understand. The main character in Sleep Hollow definitely shares these same traits, but yet he is intelligent and deeply caring. There is something about the awkwardness of the character, in this spooky and unusual world, that reminds us of the INFP in the best possible way. There is a somber and eerie feeling to this unusual film, but at the same time there is a strange love story inside of it. The entire feel and storyline gives us a strong INFP vibe. ENFPs are charming, playful and unique people, which is reminiscent of the cult favorite movie Hocus Pocus. Hocus Pocus might be spooky, but it is also deeply emotional, nostalgic and sincerely meaningful. The combination of characters makes for a touching movie with a ton of heart and seriously unique entertainment. Everything about it feels like the ENFPs personality, making it the perfect Halloween themed film to represent them. ENFPs are drawn to things with meaning, but they are also interested in the more unique and even strange things in the world, which is why Hocus Pocus is their ideal spooky film. Carrie is one of the most classic horror films in creation, with a cult following and obsession. The reason this frightening and unnerving film makes us think of the INTJ, is because it is based on someone who is underestimated. The main character Carrie takes time to come into her abilities and understand just how powerful she is, which is not unlike the INTJ. When they are younger people might underestimate their strengths, since they are still coming to understand themselves. INTJs are also more reserved people who keep to themselves and just want to focus on learning. When someone pushes them to their breaking point they are formidable and unstoppable people, much like Carrie, just usually in a much less murderous sense. ENTJs do have a quirky side, and there is something about Beetlejuice and the entirely over the top personality he possesses. The film is funny, entertaining, and yet there is a strength in the characters that makes it even more enjoyable. While ENTJs are intense people who work hard to get things done, they also have a playful and even a bit unusual side to their personalities. They can be extremely entertaining and fun people when the right mood strikes them, and that is why Beetlejuice reminds us of the ENTJ. Frankenstein is somewhat heartbreaking, but yet unusual and quirky. The scientific aspects and the curiosity remind us of the INTPs personality. The vibe of the film is definitely similar to the personality of the INTP, a bit dark and unusual but yet intelligent and creative. There is so much depth to the story that goes underneath the surface, and so it takes a bit of analyzing to really understand the many layers of what is going on and what it is trying to convey. This is something that reminds us of the complexities of the INTP, as well as their intelligence and curiosity. The Nightmare Before Christmas is a unique, fun and entertaining film, which let’s face it can be both a Halloween or Christmas movie. The reason it is best to represent the ENTP, is mainly because of the character Jack Skellington, and his insatiable curiosity. He might have it all, but yet he finds himself bored and wanting to try something new. Jack is a scientific and curious Pumpkin King, who gets himself into quite a bit of trouble because of his desire to experience something new. This is not unlike the ENTP who constantly wants to seek out challenges and new experiences, but yet their charm somehow helps them climb out of whatever trouble they have caused. When ESTJs do things they do it right, and so there is nothing more perfect to represent them than the classic Halloween film, “Halloween”. ESTJs remind us of this film for the classic horror that it is, and the sincerity in it. These truly classic horror films often possess their own set of rules and this is something that is highly reminiscent of the structure following ESTJ. They are efficient people who do things right, instead of doing it halfway and lacking the truth that a real horror film needs. Halloween is about an un-killable character, much like the unstoppable personality of the ESTJ. There is something wholesome and warm about the movie Casper, and so it reminds us of the ISFJ. While Casper is a slightly spooky and Halloween themed film, it isn’t all that scary. It is a movie filled with heart and love, and is about making connections. Casper is about finding your family and remaining by their side no matter what. ISFJs are loyal people who care most about their family, and want to do whatever they can to take care of them. That is something that you can feel from Casper, along with a sense of warmth and love which makes it a film to perfectly represent the ISFJ. The Corpse Bride is a romance at the heart of its unusual and eerie setting. It is about forgiveness, compassion and in the end sacrificing for others. There are a few truly sincere and good characters in the midst of some fairly rotten ones, but in the end goodness prevails. In the end true love wins and in the best way possible the Corpse Bride herself sacrifices for the sake of others. The romantic and giving nature of the film is definitely reminiscent of the ESFJ personality. Scream has a plot that represents breaking and following rules, and getting oneself into a bit of trouble. The thing about Scream that represents the ISTP personality, is the level of thrill and curiosity it evokes. ISTPs enjoy being able to take something apart and learn more about it, and so that represents the way this film requires someone to really think about what is happening in order to uncover the details and why it is unfolding the way it is. While some might find it to be a bit pedestrian, it is still thrilling and entertaining. ESTPs are exciting and adventurous people, who want to seek out things that entertain and challenge them. A Nightmare on Elm Street is a thriller, with an intense and surprising horror feel. For something to represent the ESTPs personality it has to be intense and even a bit over the top. The entire vibe of this film is a bit unreal, and let’s face it, seriously scary. The frightening story and the constant action is the only film that could truly fit the ESTPs Halloween movie. Practical Magic is a soulful and complex film, filled with unusual characters and plenty of heart. ISFPs have truly deep emotions and are often drawn to things that they can feel a connection to. Practical Magic has a horror element and some seriously supernatural aspects, but at its core the film is about family and being open to love. ISFPs are romantics at heart and so a film with a deeply romantic storyline is perfectly reminiscent of them. 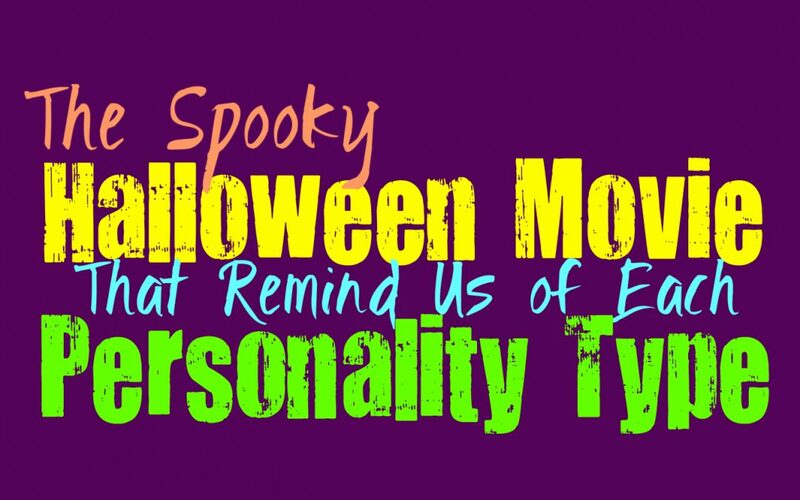 Halloweentown is the absolute perfect movie to represent the fun and playful personality of the ESFP. The movie is truly an exciting trip into a different world, and in the middle of the spooky aspects it is fun. It is almost like a giant party, all about brightness and family, which is very much like the ESFP personality. They are caring people who just want to make life fun, and while they have a weird side they also have a very loving side. A typical horror film wouldn’t make sense for the ESFP personality, so it needs to be something much more fun and charming.